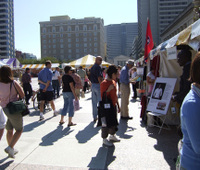 The Festival was held at Legislative Plaza in downtown Nashville. 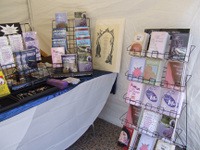 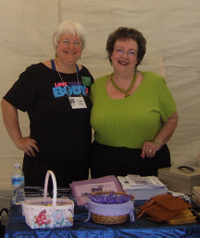 The weekend was sunny and warm -- hot enough that the group stashed the booth's freebie chocolate in a basket instead of including it in their giveaway "swag bags" (which contained flyers, postcards, bookmarks, and a "Queen of Rubenesque Romances" pen). 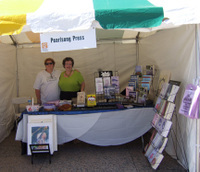 ...and a closeup of the booth displays.